Matest proposes a wide range of testing equipment and high stiffness compression machines (manual, semi automatic or automatic) which allow to test concrete cubes, cylinders and blocks and satisfy the EN and other International Standards.... Universal Tester 2.5kN The 2.5kN is a single-column, universal tester. In stand-alone mode the machine can be programmed with up to 100 different test methods ranging from the most basic to the most sophisticated machine control, all with full graphics and statistical display. All universal testing machines by TesT will always be delivered with safety device and electrical shut-off. All models are provided with safety contacts on the doors and firmly mounted rear panels. Doors and rear panels are made of impact resistant MACROLON® which does not splin-ter. This corresponds to the requirements of DIN 51233. By means of these measures accidents can be avoided and the... Universal Testing Machine Servo Series The machine is hydraulically operated, vertical, floor mounted, designed for testing metals and other materials under Tension, Compression, Bending/Transverse Loads. 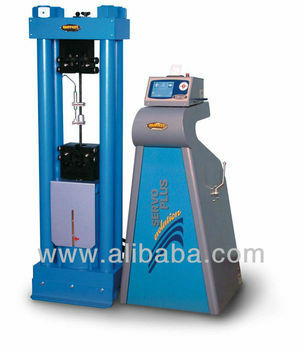 This Compression Testing Machine is a hydraulic, electrically operated unit, designed for conducting compression tests on concrete specimens up to 20 cm. 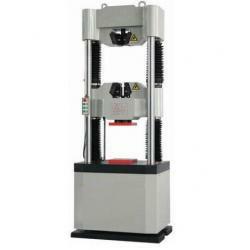 Diameter (or width and depth) and 30 cm, in height and also rocks and various other materials.... Shimadzu Computer-controlled hydraulic servo system The functions of the UH-I series are greatly advanced, as compared with conventional testing machines. Suitable for testing a wide range of metallic materials. Load Range 100 kN to 1000 kN Accuracy conforms to IS 1828. Variety of extra accessories such as attachments for Brinell test, threaded & shouldered specimens. 180 0 Bend test, Load Stabiliser, Shear Test, Extensometer etc. available.